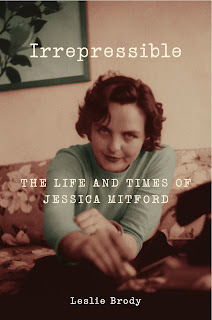 Admirers and detractors use the same words to describe Jessica Mitford: subversive, mischief-maker, muckraker. J.K. Rowling calls her her "most influential writer.” Those who knew her best simply called her Decca. Born into one of Britain’s most famous aristocratic families, she eloped with Winston Churchill’s nephew as a teenager. Their marriage severed ties with her privilege, a rupture exacerbated by the life she lead for seventy-eight years. After arriving in the United States in 1939, Decca became one of the New Deal’s most notorious bureaucrats. For her the personal was political, especially as a civil rights activist and journalist. She coined the term frenemies, and as a member of the American Communist Party, she made several, though not among the Cold War witch hunters. When she left the Communist Party in 1958 after fifteen years, she promised to be subversive whenever the opportunity arose. True to her word, late in life she hit her stride as a writer, publishing nine books before her death in 1996. Yoked to every important event for nearly all of the twentieth century, Decca not only was defined by the history she witnessed, but by bearing witness, helped to define that history. "It is thrilling to have my remarkable sister brought back to life in this book. Brody's superb research has resulted in an entertaining read which is often hilarious and always true to Decca." "Leslie Brody reintroduced me to a friend I loved so dearly; told me stories about events I did not participate in, and it makes me jealous. Thank you for the book." "Such a refreshing biography of Decca! What an inspiration Leslie Brody's calm yet always vivid history should be to young rebellious souls oppressed by the gloomy cul-de-sac into which our national politics have drifted. Here's the story of a true rebel in the finest traditions of upper-class English women who kicked over the traces. Decca's journey took her from Republican Spain to Oakland, California. Brody is never better than when describing the energy and idealism of Communists in those vicious postwar years and Decca's humor and enormous bravery in the face of real physical danger." "With passion, commitment, and a keen sense of adventure - the same qualities that defined her famous subject - Leslie Brody presents Jessica 'Decca' Mitford as the delightfully complicated character she was: aristocrat, Communist, civil rights activist, mother, author, American dreamer. In brisk but sympathetic prose that will resonate even with those totally unfamiliar with Mitford, Brody traces the fascinating evolution of a woman whose life was shaped by the great political forces of her time, yet who always stayed true to herself and her personal vision. Irrepressible is a great, all-encompassing narrative in the age of niche." “It is all about my mommy and daddy. It is quirky but a spectacularly told story. You should be so lucky as to have Leslie Brody write a book about yours."